Have sling, will travel! In this edition of Men in Slings, we are thrilled to feature new dad Vincent and his adorable son Leland. From their local coffee shop in Vancouver to the other side of the world, read on to learn about the places they go in their Sakura Bloom baby sling! What is your favorite thing about a baby sling? The physical and emotional connection that you feel when having your baby close to you. We hear you traveled to Hong Kong and Toronto with just a Sakura Bloom sling and nothing else (no stroller). Can you tell us about that? Our boy was just under 20 lbs. when we were traveling so it was very manageable to use a sling all day. In fact, the freedom and mobility is unbeatable when traveling in urban cities that are cramped and full of stairs. We did get a lot of stares however mostly because a) dads generally never carry their kids and b) slings are ultra rare in Hong Kong. What do you wish other fathers knew about using baby carriers? A baby sling is a lot more comfortable for both the baby and dad than most carriers. Also, babies like to be close to you. Eye contact and touch is extremely important and strollers deny them of these needs. 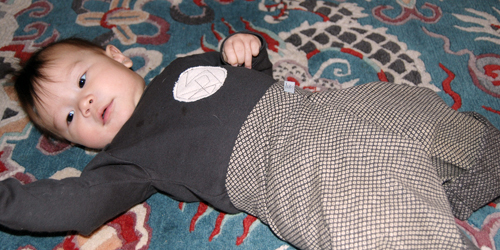 The slack fabric is great for covering the baby when it’s sunny out but still allows him to see through it! Also, the packaging for the sling is very well designed. Hanging innocently on the rack at Planet Kid were a row of shirts and sweaters. Innocent, that is, until one got close enough to see the detailing on them. Then there was no walking past them. Wildly hip tees and sweaters for girls and boys made from repurposed retro and vintage textiles: old tees, sweaters, sports shirts. Fashionable serged and raw seams round out the craftster look. Each cooler than the one before it from the talented hands of Toronto designer Susan Harris. Insanely stylish for your little ones, and available in womens’ sizes, too! Sold in stores around Canada, as well as Susan Harris’ studio at 135 Tecumseth right off Queen Street West. This is part of a series about cool Canadian things! Walking down Toronto’s Queen Street West, we passed a tiny store front with hip, but unusual looking onesies in the window. In we went. Once in the store, LINOliving designer and owner Cheryl Chapin showed us her LINObaby line, including her brilliant Thai fisherman’s pants for babies: the Thai Easy Pant. Wide legged, with a fold-over waistband that grows with baby, and made out of to-die-for Japanese cottons or perfect linens for summer. In two sizes: 4-14 months, and 15-24 months. An absolutely brilliant re-interpretation of a Thai classic. Did we mention that these pants are brilliant? On the spot, barely even looking at the price (although they were on sale at the time), I bought Baby L. an outfit (see above). Cream and dark charcoal. Colors one doesn’t often associate with babies, but that look just divine and seriously fashion-forward. In addition to being well thought-through in terms of design and fabric, the finishing on these pants is just superb. They are beautiful, right down to the cuffs, which are designed to be rolled up and then let down as baby grows, and to look perfect at each stage. Really. Someone must start importing these to the U.S. and soon! Now if only they came in adult sizes (especially for pregnant or postpartum women and all that growing and shrinking going on), then all would truly be perfect in the design world. This is part of a series on cool Canadian things! Fidoodle is one of those kids’ companies that makes me wish, really wish, that I was a child again. Not that I won’t play with their things now (I will), but they would just be all that much more fun if I was a kid. So, what is it that Toronto-based Fidoodle makes? Just about the coolest things you could dream up: puzzles that turn into puppets that turn into art. Story based, interactive mobiles. Animals designed to be held and to inspire dreams. I fell in love with the Cinderella jigsaw puppet at Planet Kid. So smart, so creative, so fun! Get yours in Toronto at Planet Kid, or for the rest of us, on Etsy! Travel + Baby = Toronto! Baby L. and I recently took a trip to Toronto. I’m starting a new research project there and needed to get the lay of the land. Turns out that the neighborhood where I’ll be working is right next to some of the city’s hottest baby and kids’ boutiques! ella + elliot is a newish boutique specializing in all things modern for baby. We loved their selection of products, from Netto to Dwell to all sorts of European labels new to us. A beautiful store (pictured at right) with a thoughtfully chosen selection of items. 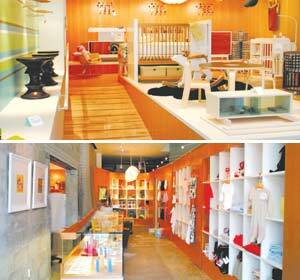 Polka Dot Kids is a narrow, airy store full of treasures to discover, including many from Japan. It was here that I saw the most delicious Imps and Elfs grey woolen smocked trapeze dress. I doubt it will be there when I return this summer, but if it is, I’m buying it! Kama Kazi Kids is one of those kid stores that you wish you could shop at …. for yourself! They have one of my favorite U.S. lines, Imoga, and lots that were excitingly new to me such as Chipie and Minisu. Kol Kid is a store stocked with classic and popular treats–toys and clothes that were familiar to (and loved by us). Lots of good standards such as Haba and Skip Hop and excellent quality items from throughout North America and Europe. My favorite store, however, was one that specialized in only Canadian designers: Planet Kid. Some amazing, amazing things, many of which need to make their way down here to the U.S., and in honor of which we are naming this Canada Week. Each day will have a new post about one of the great Canadian, including many Torontan, designers featured at Planet Kid. We were in Toronto on a chilly, but brisk and sunny day in December. 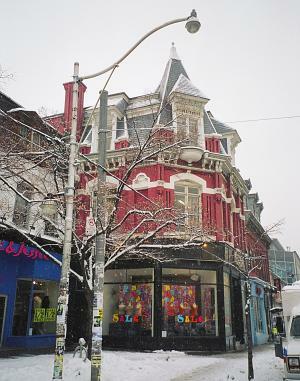 Queen Street West is a neighborhood full of hot boutiques, trendy galleries, and enticing restaurants, bars, and cafes. Most irresistible to us after an afternoon of walking and shopping? Dufflet Pastries. Dufflet is a Toronto institution and has more than earned that title! Think up the perfect dessert, be it chocolate, or caramel, or raspberry, or whatever it is your heart desires. Add yummy drinks on top of that, lots of unique Dufflet label chocolates and other goodies to go, and Dufflet is a must for any Queen West outing. Good chocolate and stunning baby and kids boutiques. Other than some warmer weather, there’s not much more that I need!